Remember A Charity in your Will Week is an annual campaign dedicated to promoting awareness of leaving a gift to charity in your will. This year’s campaign takes place from 12-18th September, and we’re excited to launch a new partnership and new Legacy Brochure answering questions about leaving a gift in your will to help support our work for future generations. 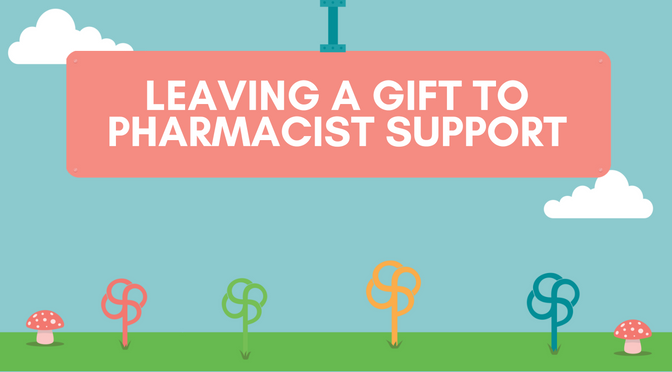 This year’s theme, #MyWisdom – pass on something legendary is about celebrating legendary advice and getting more people in the pharmacy profession thinking about what their lasting memory will be. Our new Legacy Brochure is packed with information on why we all need a will and how legacy gifts are so vital to our future work. Raising awareness in this way we hope will encourage people to start having their own legacy conversations – sharing with friends and family why having a will is so important to them and who they would like to remember. For ‘Remember a charity in Your Will Week’ we have teamed up with Penningtons Manches law firm who will provide a will-writing service at a reduced cost of just £50 for the week to people wanting to write or update their will. Following a free no-obligation discussion, they will be able to provide you with a basic will for the reduced administration price of £50. For more information or to arrange an appointment please contact Stuart Adams on 0844 669 6148 email Stuart.Adams@Penningtons.co.uk quoting ‘Pharma175’ or click here.